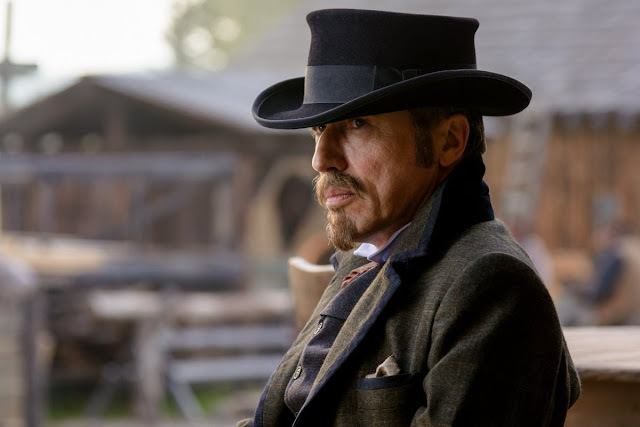 When you have an actor of Brian Cox standing introducing the UK Premiere of a Canadian western at the 2016 Edinburgh International Film Festival you know your in for a treat and this genre classic was certainly that. All right I admit I am a lover of westerns and Forsaken (2015) is certainly a good old-fashioned tale of good verses bad. Directed by Jon Cassar, who will be best known for his work on the first seven seasons of the TV drama 24, it tells the story of a reformed gunslinger who attempts to resist violence to appease his preacher father. Will John Henry use his guns again? John Henry Clayton returns home after ten years away following the end of the civil war in 1865. 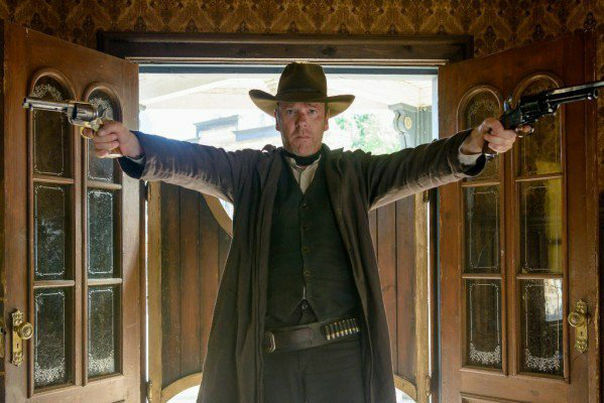 He has become a man that never hesitates to kill another in a gunfight. The problem with John Henry's return is that since his departure his hometown is now jointly controlled by a vicious gang boss and corporate businessman James McCurdy (a very evil Mr Cox) who are terrifying the local farmers into selling their land. If they refuse extreme violence occurs normally ending in a funeral. Gang boss Frank Tillman (Aaron Poole) seems to relish the violence he is employed to carry out. Also employed by McCurdy is a famous gunslinger known as Gentleman Dave Turner (the wonderful Michael Wincott who played Philo Grant in one of my all time favourite movies 1995's Strange Days). McCurdy knows that if John Henry decides to take the side of the farmers and pick up his guns again then the eloquent Gentleman Dave is the only man capable of facing him in a gunfight. 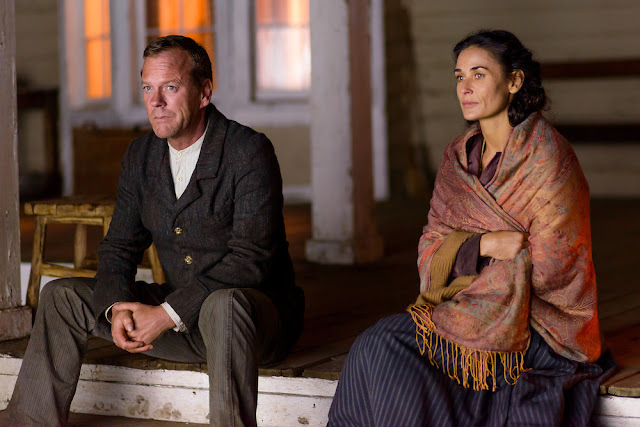 Now married with a young son Mary Alice Watson (Demi Moore) is another temptation for the troubled preachers son as she was the woman he left behind. Will or won't he pick up his guns to help the brutalised farmers, what would entice him back to kill men again after the promises to his father? I think we could all guess the answer to that and by the end of the film you will be gagging for that good fashioned gun battle. Will he have to face Gentleman Dave Turner in a fight to the death? The film's real strength is in the partnering of father and son Kiefer and Donald Sutherland who play father and son in the movie. Brian Cox gave us some background to their relationship informing us that the turbulent association they had on screen was very much like the relationship they had off screen, both men had not got on very well and this film was a chance to put that right. Tears were shed, voices were raised but all was well in the end. Interestingly the two actors have only previously appeared in two films together, but never in the same scene. Will John henry live long enough to rekindle his affair with Mary Alice Watson? 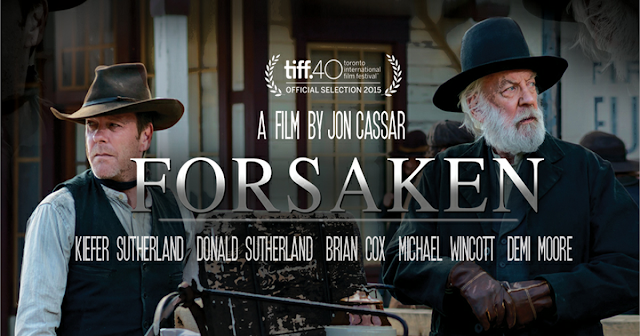 Shot in the province of Alberta in Canada it had its World Premiere at the Toronto International Film Festival in September 2015 but has not had a general release in the UK but can be found on DVD and believe me its very good example of the western genre and is well worth sourcing.